Nick Van Der Kolk is the creator of the American podcast Love + Radio which has been on air since 2005. Each monthly instalment features in-depth, otherworldly-produced interviews with an eclectic range of subjects, from the seedy to the sublime. I first heard Gregory Whitehead’s work on Chicago Public Radio—a piece called “Mind, Body, and Soul”. Though it’s relatively accessible by Whitehead’s standards—a pretty straightforward (fictional) interview with a man committing himself to eating several books—it stopped me in my tracks. So-called public radio in the US is a conservative (small ‘c’) medium, with an increasing emphasis on doing things in a way that is repeatable and never calls attention to itself. “Mind, Body, and Soul” was the opposite: bizarre subject matter permeated by jarring though obviously intentional choices of cuts and sound effects. Whitehead’s work opened a door to thinking of radio as a medium for intuitive association and poetic investigation. And, unlike a lot of audio art, whose tone of self-seriousness can lead to alienation, Whitehead never loses a deep sense of playfulness. Today, the popularity of podcasts has exploded thanks to a basic understanding of what is listenable. I think his spirit is an important one to keep in mind if this young medium is going to continue growing—not just in terms of downloads—but creatively as well. Gelsey Bell, an inspiration, a breath of pure air: for her fearless wanderings through the mysterious labyrinth of the human voice; for the shadows and embers of her own magnificent voice; for her devotion to an honest relationship listeners and readers, free from jargon and obfuscation; for her open engagement with a wide diversity of other voices far from her own; for the light touch of her scholarship, and the depths of her intuition; for her wit, her humor, her laugh, and her happy feet. Kate has a fearlessness. You can see it when she sings – she jumps in head first with her whole being. Kate uses the act of composing music, and particularly song form, to mull over philosophical questions like the slow roasting of a pig on a spit, with many turns to different angles. I am particularly inspired by how Kate explores the relationship between music and language. She uses ideas and techniques in ways that wouldn't occur to me. Her conclusions are not always the same as mine and our compositional instincts breathe with different hues, but that only makes her work more intriguing to me. I have a lot to learn from it. Her music is full of embodied philosophical arguments that I want to respond to with other songs – songs that span all the crevices between the quick complexity of speech to long pure tones of sung harmonies. I have also learned a lot from the way Kate is not yet set in her techniques and is open to trying things in new ways. If she wants something in a work that is better communicated with dialogue than a song, she writes a scene. If a compositional idea is working best in structured improvisation rather than her scored parts, it becomes an improv. She is rich in integrity and curiosity. She is playful and whimsical. The way she works as a performer and a composer inspires me to be more myself, more true to my own ideas, to work harder, and to reach into an infinite depth of sincerity. I met Tomiko at the Camargo Foundation in 2008 and fell for her work immediately - it's very sensually beautiful and has a deep, mythological sense of character and place without being overtly narrative or portentous. The series of photos she took at Camargo in particular are incredibly rich with symbolism. On the other hand, the textures and contrasts in her work give the surface a fascinating abstract quality that plays interestingly with the content. I just love it! 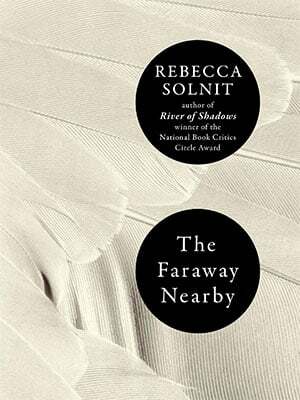 Beautifully weaving history, ecology, politics and deep thought into a riveting narrative, reading Rebecca Solnit is a bit like spending the afternoon with a brilliant friend who knows you intimately. She is at once searing and loving. She always shows up when I need her. The overarching element throughout my own work is a relationship to place. Exploring the geography of changing landscapes, I create loose mappings that echo the internal terrain of thought. I find quiet, yet significant moments in the transitional place between land and water, destruction and reclamation, thought and action. Her writing takes me on a journey, visiting places so close to my heart - the landscape, our place within it, the damaging and restorative actions of humans - that I can see, feel, hear and breathe the scene on the page. It helps me better understand the work I am making. Although I first came across Solnit’s writing in a scholarly setting a decade ago in As Eve Said to the Serpent, over the years I come across her writing at just the right time. In considering photography’s explicit role in western expansion while working on Rattlesnake Lake, I suddenly come across a passage in River of Shadows talking about the exact same thing. When Just Six Degrees contacted me for Chain Reaction, I listed her as an inspiration, yet within the next few months, my life changed dramatically – my father passed away after a long illness and I moved to San Francisco. As part of an art seminar I was developing about place in my new “home”, I again came to Solnit for guidance in Infinite City: A San Francisco Atlas. At the same time I also purchased her latest book, The Faraway Nearby, which I am in the middle of reading. In it she talks about many things including the decline of her mother and the passing of generations. Being so recently separated from my father, whose passion for exploration has always influenced my art practice, I am reading this one slowly as I unwind my own grief. I am not sure how it keeps happening, but I feel grateful Rebecca Solnit puts into words the things that I cannot.